Basic Ikebana format is a scalene triangle. Each angle represents a different element: sky (the top one), earth (the bottom) and us humans (the middle). These three elements are balanced and co-exist in harmony. Using this format, you can express the power of plants growing towards the sun and the beautiful shape in the natural environment. Because these three elements represent the entire world, there is nothing else needs to be added. And since the balance is very important in Ikebana, nothing excessive is allowed. This is the ultimate essential. 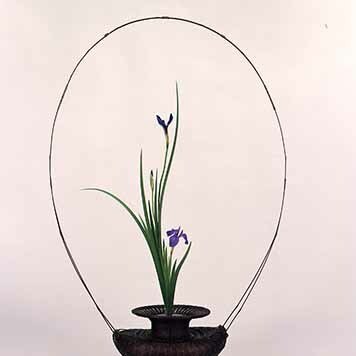 Current Ikebana is believed to have been founded in the 15th century, when Ikenobo Sen-kei (a renowned Zen monk in Kyoto) established his flower arrangement style. His works were further refined by the monks who succeeded his school. After about 500 years from Sen-kei, Ikenobo is the largest school of Ikenaba and the headmaster is the 45th in line.